The combination of music and images is always a good way to express emotions because they often complement each other perfectly if you can find free to use music. Creating a slideshow and pairing it with a tune you love can be a great way to preserve your fondest memories of an event that has a special meaning for you. iPhone’s Photo app enables its users to create slideshows with music effortlessly, but if you want some more advanced features, you will need other third party apps. In this article, we will explore some of the latest apps on the App Store that can be used on almost any iPhone model including iPhone X to create a slideshow. If you want to have full control and more advanced editing options, we recommend using Filmora9 on desktop [Windows & Mac] to help you make slidshow. Filmora9 has more than 150 effects to beautify your slideshow. There is an Audio library which provides several different style music for you to choose. Besides, it supports importing photos from various devices, including phone and iPad. Just get started with this easy to use Photo Slideshow Maker. iPhonography has never been more popular, and iPhone owners who want to take selfies or capture beautiful landscapes can only benefit from using iPhone photo editors that enable them to enhance their photo slideshow with music. 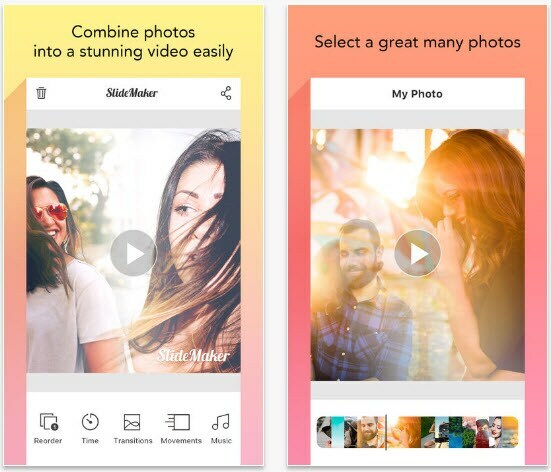 These are some of the best photo editing apps for iPhones that will assist you in creating a wide variety of different styles of photo slideshow with music. Editing videos or creating photo slideshows with FilmoraGo is a simple three-step process that requires you to select the footage or photos you want to edit, add music to slideshow, filters or transitions and share it on your social media account. 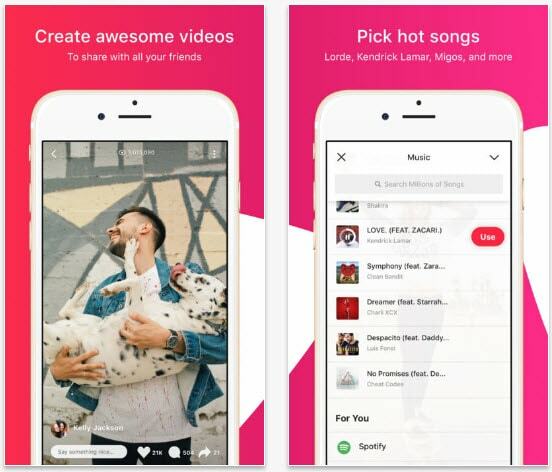 This app features a library of licensed songs, which means that you can simply select the song you like and add it to the slideshow you want to create. In addition, FilmoraGo also features professional video editing tools such as PIP, Color Tuning or Audio mixer that will allow you to produce amazing slideshows with music. The app can be downloaded for free, but it contains in-app purchases that might increase the quality of your photos and videos. Pic Music is specifically designed to help its users create slideshows with music, but it lacks some of the advanced photo editing features. 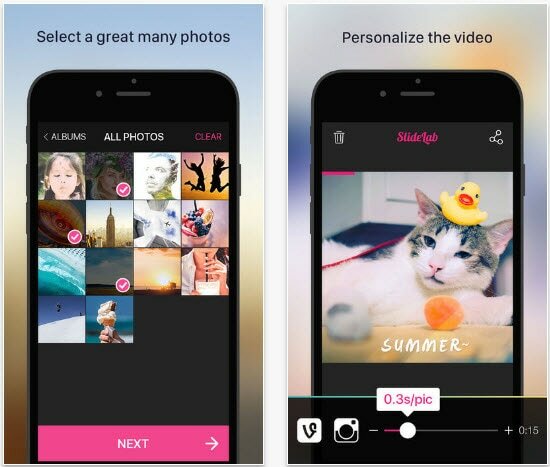 This best slideshow app lets you use photos from your camera roll and it provides an instant preview, which allows you to readjust the position of the images in the slideshow. Pic Music has its own library of royalty free music, while it also allows you to record your own voice. Adding text and transitions is also an option that can improve the quality of the photo slideshows created with this app. Despite the fact that Pic Music app is free, an in-app purchase is required if you'd like to remove the watermark. This photo slideshow app with music doesn't offer much more other than the remarkably powerful tools for creating slideshows that contain music. You can upload images from your camera roll or a photo album, and easily rearrange them by dragging each photo to the exact spot in the slideshow where you want the picture to be located. The app lets you use the music you have stored in your iPod library, and selecting which part of the song you want to use requires you to just drag the sound file. The pro version of the Pic Flow app can be purchased for $1,99, while the Unlock Everything options cost $2,99. However, the free version of the app features 18 transitions, and all other tools necessary to create an amazing slideshow with music. 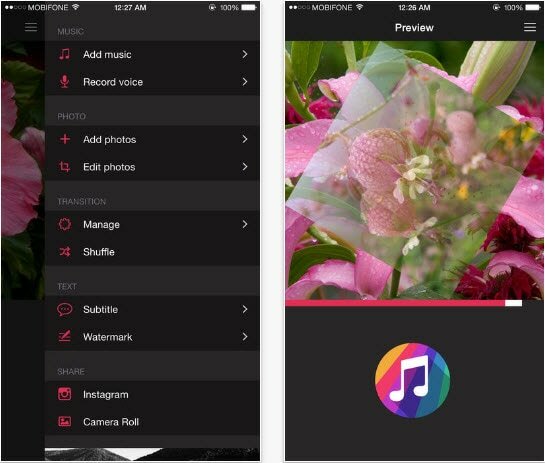 Making photo slideshows with music with this iPhone app is a quick and fun process. In addition to being one of the best slideshow tools, Slide Maker is also a powerful photo editor, that allows you to enhance your photos before you feature them in a slideshow. The app lets you crop your photos or keep their original size, while you can also rotate images and add transitions. Built-in royalty free music is available to app's users, and creating slideshows with music from your own music is also an option. Slide Maker lets you choose the point in the slideshow at which you want the music to start and it can automatically adjust the duration of the slideshow. If you would like to turn your photos into an amazing slideshow that also contains music SlideLab is among the best choices you can make. The app provides a large number of awesome filters that will make each photo in the slideshow unique, while the large collection of transitions can be used to avoid sudden jumps between photos. You can choose songs from the app's music library or use any track you have in your collection. Despite the fact that the free version of the app is available, an in-app purchase must be made to remove the watermark. SlideLab is a perfect tool for the production of slideshows with music you want to share on social media because it provides a plethora of options which allow you to adjust the duration or the aspect ratio of the slideshow. Each of the features this slideshow maker app offers will make your slideshow more entertaining. The app contains a music library that is updated daily, which means that you'll never have to worry about the song you want to use in your slideshow. Music filters and effects are influenced by the beats of the song and each filter reacts differently with a different slideshow. Furthermore, you can use the in-app camera to create amazing lip-sync videos, while you can also utilize the photo editing features to enhance your slideshow photos with music. Besides being an amazing app, Filpgram is also a community with thousands of members and it enables you to share your slideshows and all other creations with like-minded people. 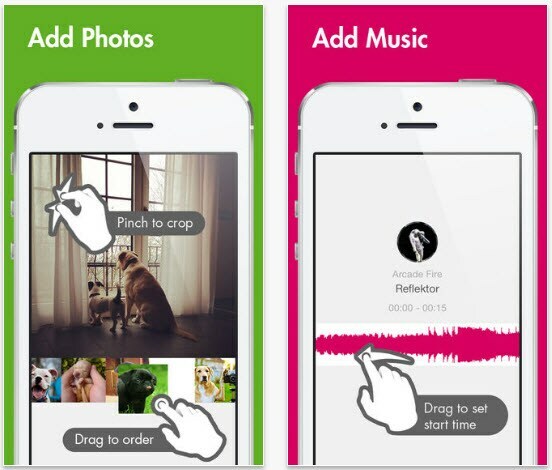 This app also lets you share slideshows with music on any social media network you can think of. Above are some of the best apps to make photos with music on iPhone, if you want to other solutions, check our picks of best video makers with music for iOS and Android. When creating photos with music on your Mac or Windows computer, we recommend you to try Filmora9 to empower your imagination. Featuring an Audio library, various style transitions, effects, filters, overlays and elements, an intuitive interface and visual audio editing, Filmora9 will help you turning your photos to videos.